Adding to its growing stable of hybrid smartwatches, Skagen has announced its latest connected timepiece collection will be the Signatur Hybrid. The hybrid watch range smart functionality without compromising on design. The new style, boasts an activity and personalised notification alerts, sleep tracking function, and hands-free control options. The Signatur Connected is an advanced and stylish hybrid smartwatch series that contains three different colors. As shown in the images, the smartwatch sports a classic rounded watchcase design, and the well-designed watch dial not only clearly displays time, but also complements to the fashionable aesthetics. Meanwhile, its leather strap can be easily interchanged with other 20mm straps for a custom fit. The smartwatch uses Bluetooth 4.1 to wirelessly communicate with your smartphone, and it works with iPhones with iOS 8.2abd above and Android phones with Android 4.4 and above. Using the wireless communication, the Signatur Connected always shows you accurate time and date. In the meantime, once receiving a text, electronic mail or call, the smartwatch will send you discreet notifications. As a hybrid smartwatch, Signatur Connected is powered by using a replaceable CR2430 coin-mobile battery, so it has no recharging required. Moreover, a fitness tracker has been integrated into the wearable for tracking your activity and sleep quality. In admiring, you can also use it to control your music playback. The Signatur Hybrid smartwatches are available starting today, with prices on the four styles ranging from $175 to $195. 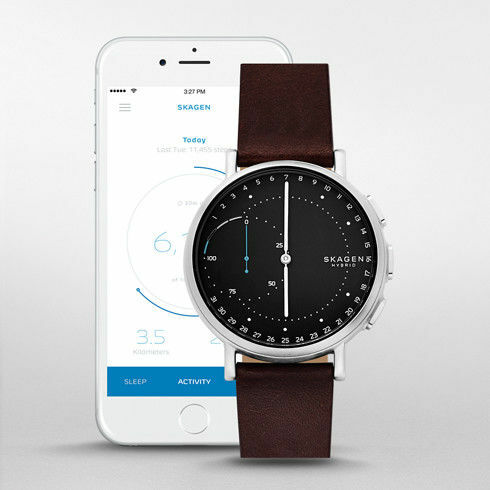 They are the first of many to come; last year, Skagen promised to release nineteen new hybrid smartwatch styles in this year. If you are interested, jump to Skagen official site for its more details.